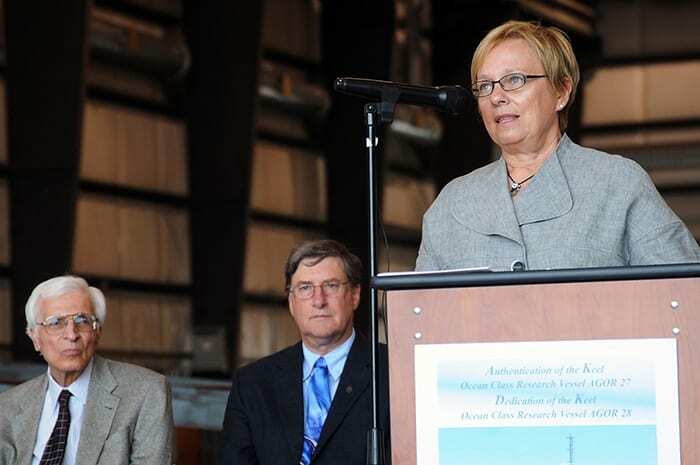 Senior officials from the Woods Hole Oceanographic Institution (WHOI) joined the U.S. Office of Naval Research (ONR) at a ceremony Aug. 17 to mark the beginning of construction on the high-tech, ocean research ship AGOR 27, which will be operated by WHOI. 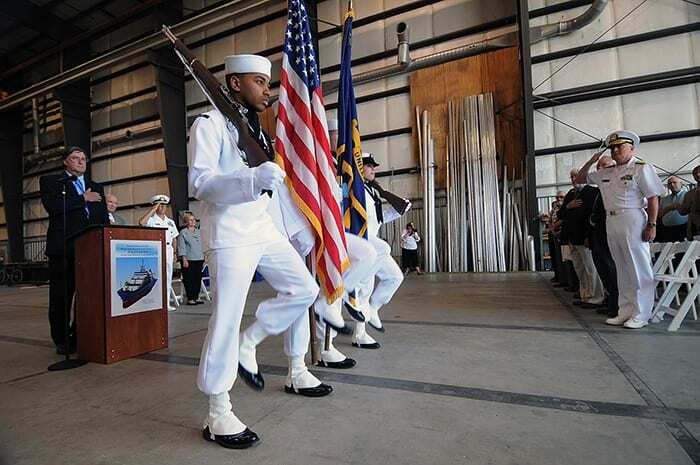 During the traditional ceremony held at Dakota Creek Industries shipyard in Anacortes, Wash., the first pieces of steel comprising the keels for two new research ships funded by ONR —AGOR 27 and AGOR 28, which will be operated by Scripps Institution of Oceanography—were authenticated with the keel certifiers’ initials. WHOI currently operates two ocean-going research vessels, a coastal vessel, and several small craft. In addition, WHOI operates the National Deep Submergence Facility (NDSF) that currently includes the human occupied submersible Alvin, the remotely operated vehicle Jason, and the autonomous underwater vehicle Sentry. Experience gained from the operation of these assets has given the Institution unique expertise in operating and maintaining seagoing research facilities. The Ocean Class research vessel AGOR 27 will represent the latest technology and will serve a pressing need for a general-purpose ship based on the East coast of the United States. Ocean Class ships fulfill a critical role in fleet modernization by replacing the currently aging ships with vessels of global endurance, current technological capability, and optimized number of science berths. “The modernization of the academic research fleet is vital to oceanographic research, and the construction of this state-of-the-art new research vessel is a major advancement,” said WHOI’s Vice President for Marine Facilities and Operations Rob Munier. AGOR 27, which will support scientists conducting research in a wide variety of ocean missions, will have the ability to sail at a sustained speed of 12 knots with 20 berths allotted for crew members and 24 for scientists. Some of the high-tech features planned include: acoustic navigation and tracking systems that operate at various depths; a specially designed hull that diverts bubbles from the sonar area; a centralized freshwater cooling system to provide heating, ventilation and air conditioning; and dual-controllable propellers with variable speed motors for increased efficiency. Dakota Creek Industries is building the new ship with the Naval Sea Systems Command managing construction. Once completed, WHOI will operate the vessel under a Bareboat Charter Party agreement with the U.S. Navy. The target delivery of the vessel is late-2014.